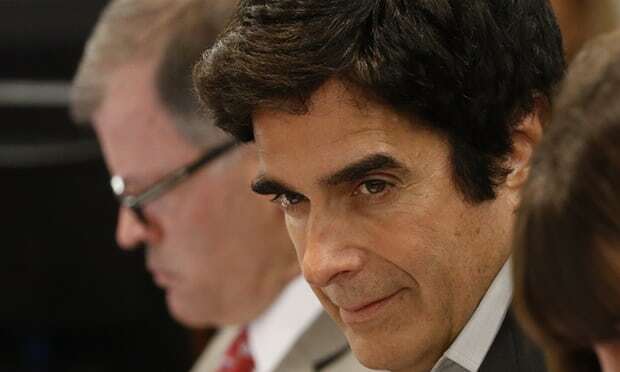 Jurors got a rare behind-the-scenes look at a David Copperfield disappearing act during testimony in a negligence lawsuit involving a British man who claims he was badly hurt when he fell while participating in a 2013 Las Vegas show. Stagehands with flashlights hurried randomly chosen participants through dark curtains, down unfamiliar passageways, around corners, outdoors, indoors and through an MGM Grand resort kitchen in time to re-enter the back of the theatre for their “reappearance” during the show finale, Kenner testified. “Is that route an obstacle course?” asked Benedict Morelli, attorney for Gavin Cox of Kent, England, who claims lasting brain and bodily injuries from his fall have cost him more than $400,000 in medical care. No, answered Kenner, whose company, Backstage Employment and Referral Inc, is also a defendant in the case. Copperfield’s lawyers lost pretrial bids to close proceedings to the public to avoid giving away performance secrets. MGM Grand hotel attorney Jerry Popovich said the illusion is no longer used to close the show. Morelli asked Kenner whether stagehands and Copperfield visually assessed the physical fitness and footwear of audience members randomly picked to participate in the trick dubbed “the runaround”. “At no time are they told what they’re going to do before they start this illusion,” Morelli asked Kenner. “They’re told as they’re running the route, correct?” Yes, Kenner replied.